On-Rail Racks are made to both safely store your surfboard and also display your surfboard deck or hull. 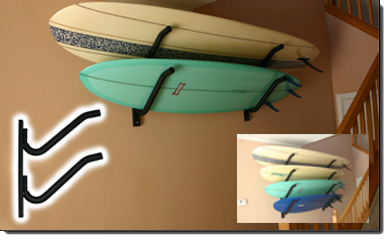 This surfboard wall rack provides convenient surfboard storage for three (3) surfboards in a compact design. This rack is angled at a 45 degree angle to accommodate deep fin clearance and also keep the board as close to the wall as possible. This rack is available in 1, 2, and 3 board versions to accommodate your board quiver. Every rack is steel, welded construction that is built to last. These racks are very heavy duty and very high quality. The arms are sturdy 1 inch tubular steel that is wrapped in high quality nitrile foam cushioning to protect your board's finish. Is this price for a set of 2 racks or is it an individual price and I would have to order 2 for a set? Yes this is the price for the complete set. You will get two "rack arm sides". You will use one rack arm side to support the front of your boards and one rack arm side to support the back of your boards. Would this rack be good for storing my surfboards outside? This surfboard rack is steel and while very sturdy, is not weatherproofed for outdoor use, where it would be subject to rusting over time. 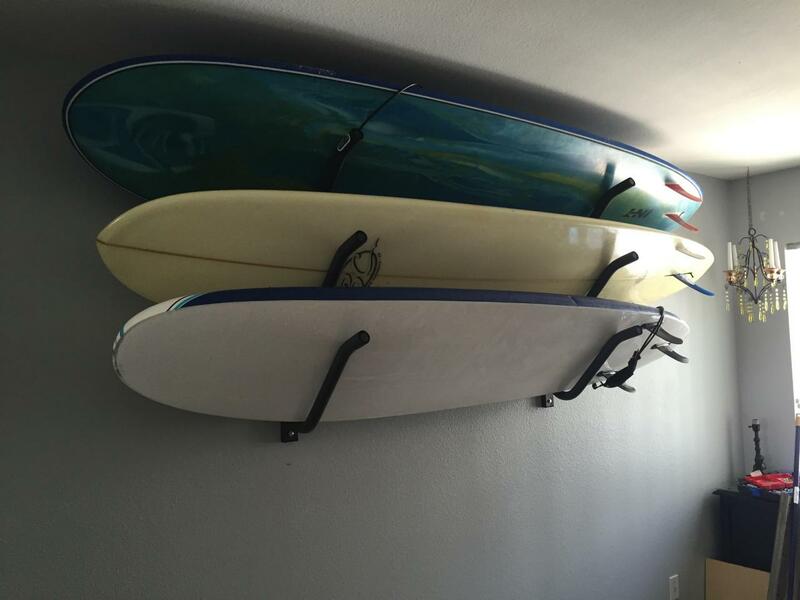 Another option might be this surfboard rack, although it is steel, it has been treated with a multi-stage rust-protection process. Alternately, an indoor-outdoor single board rack, like this stainless steel SUP rack (which will hold a surfboard) works well outdoors, or these surf hooks made from a nylon resin, which would also be fine for outdoor storage. Would this work to store a windsurf boards (18 lbs), 3 sails (25 lbs), 3 masts (15 lbs) and a boom (6 lbs), totaling 64 lbs? This surfboard rack should work find for your windsurf boards, sails, masts and boom. It is a very sturdy, strong rack, made from all steel. The key factor will be securing the rack to the wall properly. Does a sup fit ok on here? I saw it mentioned in one of the reviews. This triple on-rail surfboard rack could possibly work for some smaller SUPs, but would not be ideal and I wouldn't recommend it. The same manufacturer has a double on-rail rack specifically made for storing SUPs. The dimensions on that double on-rail SUP rack will work better for most SUPs - the arms are longer than the surfboard rack by about 5 inches, so it will accommodate wider SUPs. The centerline on the SUP rack arm is also a little wider so it will hold SUPs with thicker rails, up to almost or about 6 inches thick. I have 3 long boards 10 feet, 4 inches thick, will it work? Yes, our triple on-rail board rack should work fine for your 3 boards. 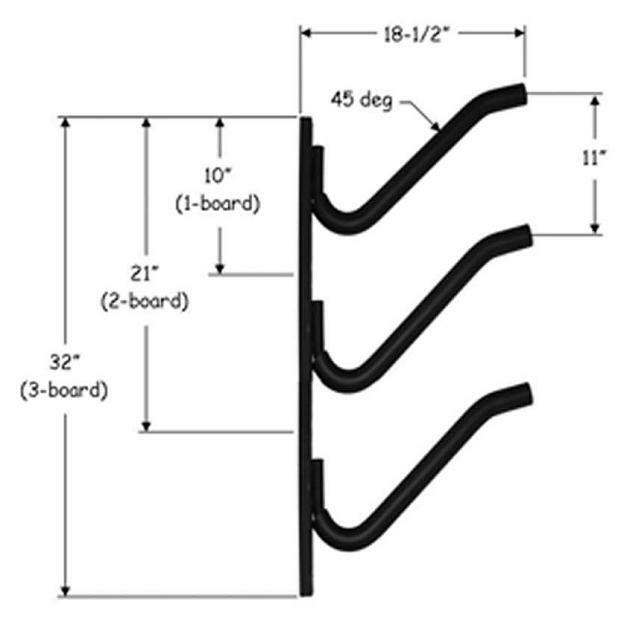 The arms can be set at whatever distance apart you need them to support the length of your boards; and at 4 inches thick, they will fit into this rack's levels, as it has a generous area for where the boards can sit and 4 inch boards should work fine. Additionally, its a strong rack when properly mounted. Will this hold 3 SUP boards? This triple on-rail rack would not be recommended for 3 SUPs. There is a double on-rail version for SUPs shown here, that will work for a couple of SUPs, as it has longer arms and will hold SUPs up to 6 inches thick, but there isn't a 3 board version of it for SUPs, just one & two board versions. We put them up in our garage and we love the quality. Easy Peasy to install, sleek, sturdy, and a hell of a space saver in a small condo! These are great with the padded racks so board does not get damaged. Looked at several styles prior to buying, and I have no regrets on this purchase. The installation was simple, and the racks easily support my 10-6 boards with no problem. The 3 board wall rack is very well made. It holds a SUP, a long board and a short with ease. Thinking about a second one. This product is eligible for free standard shipping in the United States excluding Alaska and Hawaii. Simply add this product to your cart and select the Free Shipping option during checkout. Enter your question about this product below, and a member of our staff will send you an e-mail with the answer. Complete your review using the form below. Your review content may appear on StoreYourBoard.com. Please be sure to provide information you are comfortable sharing publicly. Your email address will never appear publicly for any reason. Shopping on StoreYourBoard.com is safe and secure. We use the same security level as banks. All information is encrypted and transmitted without risk using a Secure Sockets Layer (SSL) protocol. Our store is run on servers provided by BigCommerce, all of which adhere to Level 1 PCI Compliance. © StoreYourBoard 2009 - . A Spire LLC Company. All Rights Reserved. Great News - We have a dedicated International Store just for you! It looks like you are visiting from outside the continental United States. If you would like to shop and ship any products outside the continental United States you must order from our International Store. It is optimized specifically for our customers outside of the continental United States.